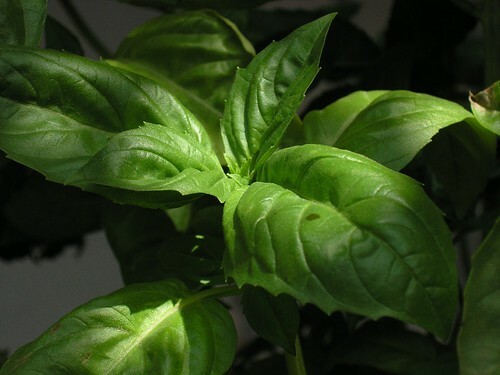 Fragrant and sweet tasting Basil is an easy to grow, popular herb. Aka Sweet Basil, with many other basil types including Sweet Genovese, Thai basil, Lemon basil and Mexican spice basil there is a good range to grow. In May or June fill small pots with moist multi-purpose compost. I use 3″ plastic pots. Sprinkle seeds thinly on the surface. About 10-12 seeds per pot. Cover lightly with fine compost or vermiculite. Keep on a warm windowsill and seedlings will appear in about 2 weeks. After 4-6 weeks the seedlings can be planted into individual pots. Treat the Basil as an annual. Plant out in June or July in a sunny sheltered spot. They make good fragrant container plants. Feed with a general purpose liquid feed and water little and often. Pinch out the growing tip to get a bushy plant. Leave the stems on pick and come again plants taking a few leaves each time. Grow several plants if you need large quantities for Pesto or other culinary uses. The seeds can be used to flavour a drink. Basil has medicinal and calming properties.